N.p. : N.p., n.y.. Paperback. Illustrations by Wilhelm Schäfer. Small 4to. Stiff pictorial wrappers. (14pp). Numerous color illustrations. Very good. Binding a bit edgeworn and faintly scuffed. Bibliographically-challenged German-language edition of this old children's rhyme, whose title translates "Bake, Bake a Cake: Old Rhymes with New Pictures." Likely published in Germany around the turn-of-the-century, to which a pencilled ownership signature dated 1903 on front flyleaf lends credence. Apparently published without title page, though the publisher identifies this title as "No. 839" on the front wrapper. It also follows the quirky binding pattern of the first three text pages running on the left-hand side, followed by a charming centerfold (pp. 7-8) and the final three text pages running on the right-hand side. Numerous small illustrations throughout are bright and quaint. Münster: F. Coppenrath Verlag, [1983}. Hardcover. Wide small 4to. Tan pictorial cloth with paper label. (20pp). Numerous color illustrations. Fine. Tight and handsome first edition of this children's tale, entirely in German, whose titles translates "Leprechauns from Cologne." Milwaukee: Geo. Brumder, n.y.. Paperback. Small 4to. Brown cloth spine and stiff pictorial card stock. (17pp). 7 full-page chromolithographs. Very good. Binding (only) a tad edgeworn and lightly soiled. A tight and nice undated (ca. late 19th century) edition of this charming gathering of superb images and text about Christ's teaching, entirely in German. Title translation: "Come to Me! A Biblical Picture Book II." Apparently published without title page. Milwaukee: Geo. Brumder, n.y.. Paperback. Small 4to. Brown cloth spine and stiff pictorial card stock. (19pp). 8 full-page color chromolithographs. Very good. Binding (only) a tad edgeworn and lightly soiled. Tight, attractive undated (ca. late 19th century) edition of this nifty gathering of superb images and text about Christ's teaching, entirely in German. Title translation: "I Am the Good Shepherd: A Biblical Picture Book III." Apparently published without title page. New York and Baden: Druck und Verlag von Ernst Kaufmann Lahr, n.y.. Hardcover. Small 4to. Brown cloth spine and brown paper over boards with large color pictorial plate to front board. (Ca. 75pp). Numerous full-page color illustrations. Very good. A tight and nice edition, entirely in German, of this slim and beautifully pictorial life of Jesus whose title translates: "We Have Seen His Glory! The Life of Jesus in Pictures and Words." Apparently published without a title page. Undated, but ownership signature on inside front board is dated 1893. The chromolithographic plates are superb and bright. Konstanz: Buch= und Kunstverlag Carl Hirsch, n.y.. Paperback. Small 4to. Stiff pictorial wrappers. 16pp. Numerous illustrations (some color). Very good. Faint edgewear only. Tight and attractive. Printed in alternating pages of brown ink and blue ink (with illustrations accordingly those colors), this German language publication is undated but circa turn-of-the-century to early 20th century. Title translates "Happy Childhood: Amusing and Instructive for the Children's World." Stuttgart: Union Deutsche Verlagsgesellschaft, n.y.. Hardcover. Text by Adelheid Stier. 4to. Green cloth spine and pictorial paper over boards. 67pp. Frontispiece, numerous illustrations (many full page), 3 full-page color plates, color decorative endpapers. Good plus. Quite edgeworn and a tad scuffed, but tight and handleable. 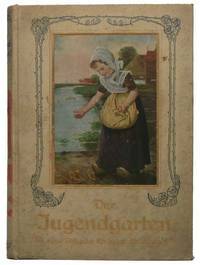 Decent sixth printing, entirely in German, of this bestselling collection of the sentimental children's portraits by this renowned German artist (1846-1909) first published in 1906, with accompanying text. N.p. : N.p., 1983. Hardcover. 4to. Glossy red pictorial paper over boards. 63pp. Numerous color illustrations. Very good. Faintest edgewear. A tight, attractive copy of this bibliographically-challenged text of words and music, entirely in German, title translation "My Favorite Children's Songs with Guitar Accompaniment." Kapp-Verlag in Benshein, Germany published this title in blue pictorial paper over boards in 1983, so apparently this is a cryptic reprint of some sort. By FRIES, N., SCHONE, Dora, BACHOFNER, A., NIESE, Charlotte, OLDENBERG, E., u.a. Konstanz: Verlag von Carl Hirsch, n.y.. Hardcover. 8vo. Grey cloth with gilt lettering and elaborate multi-color pictorial stamping. 144pp. Decorative endpapers. Very good. Mild edgewear. A tight and nice later printing of the second volume (only), entirely in German, of these nativity narratives. Undated, but circa 1910. Title translation: "From Heaven Above to Earth I Come: Tales of the Winning and Beatific Might of the Christmas Gospels." Delightful front board graphic shows three shepherds reclining under a tree at night to watch their flock as one star outshines the others and the branches above them are filled with a heavenly host of angels. Zwickau: Verlah und Druck von Johannes Herrmann, n.y.. Hardcover. 8vo. Burgundy cloth spine and pictorial paper over boards. 32pp. Illustrations. Very good. Mild edgewear. A tight and nice later printing of the second volume (only, out of four) of this slim gathering, entirely in German, title translated "Who Wants to be Entertained? Come to me; I invite you! Children's Stories and Rhymes." Undated, but circa 1910. Quite charming. Munich: Braun & Schneider, 1888. Hardcover. 8vo. Blind-embossed red cloth with gilt lettering and decorations. viii, 576pp. Chromolithograph frontispiece, numerous illustrations (several color chromolithographs). Very good. Spine faintly sunned; ownership signature on front pastedown. A tight and handsome first edition of the 34th volume of this kid's annual, entirely in German. Title translation: "Youth Leaves for Entertainment and Instruction." 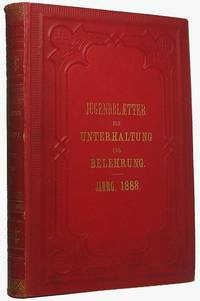 German children's book author Braun (1815-86) first published her "Jugendblätter für christliche Unterhaltung und Belehrung" annual children's magazine in 1854, which ceased upon her death -- until the series resumed (without the "christliche") "Unter Mitwirkung vieler Jugendfreunde" (with the participation of many young friends), simply listing Braun as founder. A lovely copy. Konstanz: Buch- und Kunstverlag Carl Hirsch, n.y.. Paperback. Small 4to. Stiff pictorial wrappers. 16pp. Numerous illustrations (some color). Very good. Faint edgewear, with small triangular chip at upper right of front wrapper, else tight and nice. Undated (circa 1900) copy of this slim gathering of corny, sentimental verse and tales, entirely in German. Title translation: "Cheery and Instructive Sunshine for the Children's World." Charming front wrapper graphic depicts a young girl in nightie, hands clasped as in in prayer. Mainz: B. Schott's Söhne, n.y.. Hardcover. Illustrations by Ludwig von Bumbusch. Wide 8vo. Yellow pictorial paper over boards with tan cloth tape spine. 47pp. Illustrated title page, full-page chromolithographs and pictorial borders, decorative pastedowns. Good plus. Board edgeworn and corner-rounded; inner hinges strengthened with brown cloth tape; several text pages corner chipped and edgeworn along outer edge. 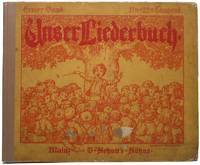 A tight and decent later printing (21st-22nd thousand) of the first volume of this noted anthology, entirely in German, titled in translation "Our Song Book: The Most Beloved Children's Songs." Despite obvious wear and loving, it's quite handleable and the numerous images are bright and superb. Front board graphic depicts a young boy standing in front of an enormous tree conducting a large choir of children seated before him. Munich: Braun & Schneider, 1890. Hardcover. 8vo. Blind-embossed red cloth with gilt lettering and decorations. viii, 576pp. Chromolithograph frontispiece, numerous illustrations (several color chromolithographs). Very good. Spine faintly sunned. First edition of the 36th volume, tight and attractive, of this kid's annual, entirely in German. Title translation: "Youth Leaves for Entertainment and Instruction." 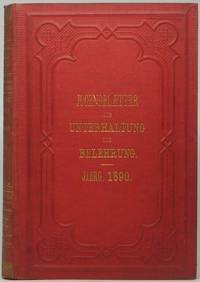 German children's book author Braun (1815-86) first published her "Jugendblätter für christliche Unterhaltung und Belehrung" annual children's magazine in 1854, which ceased upon her death -- until the series resumed (without the "christliche") "Unter Mitwirkung vieler Jugendfreunde" (with the participation of many young friends), simply listing Braun as founder. A lovely copy. Entzlin: Entzlin & Laiblins Verlagsbucchhandlung, n.y.. Hardcover. 12mo. Green cloth with gilt lettering and white, blue, pink, black and gilt decorative stamping. 96pp. Frontispiece, illustrations, decorative endpapers. Very good. Mild edgewear. A tight and attractive later printing of this young adult short stories, entirely in German, undated an inner flyleaf gift inscription dated 1923 places it circa 1920. 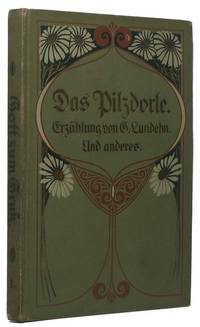 "Das Pilzdorle" we are unable to translate, though the remainder translates "and Other Tales for Young and Old." Unclear why Lundehn isn't listed as "compiler" or "editor," as the volume contains nine other short stories, all by various authors. Stuttgart: Loewes Verlag Ferdinand Carl, n.y.. Hardcover. Illustrations by Willy Planck. 8vo. Mustard yellow cloth with black and red lettering and red, black, blue and white pictorial stamping. 160pp. Color frontispiece, 5 full-page color plates. Near fine. 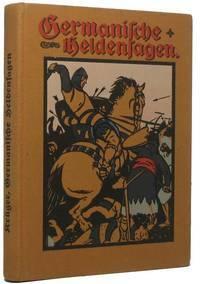 Tight and bright later printing (undated, but circa 1920) of these "Teutonic Heroic Sagas in Single Images," entirely in German with delightful color images by the noted German artist and graphic designer Planck (1870-1956). A lovely copy. Leipzig: Verlag von L. Staackman, 1906. Hardcover. 12mo. Tan paper over boards with black, red, green and yellow pictorial stamping. 179pp, (1p ad). Very good. Binding a bit edgeworn and age toned, but internally tight and nice. 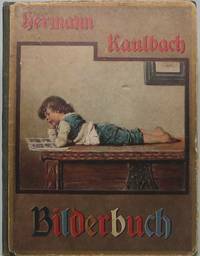 Early printing (11th through 15th thousand) of the most popular juvenile tale by this German writer and poet (1862-1926), first published in 1905. Entirely in German. Charming front board graphic shows a young girl stretching up to pluck apples off a tiny tree as her dog watches. 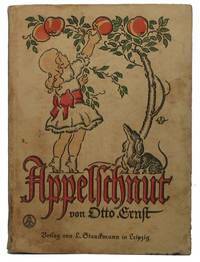 "Appelschnut" is perhaps idiomatic, as it evades translation (perhaps "Apple Picking" given the front cover graphic? ), though subtitle translates "Your New and Old Actions, Adventures and Opinions. Befiehl dem Herrn deine Wege! New York: Kunstdruck und Verlag von Ernst Kaufmann, n.y.. Hardcover. Small 8vo. Glossy pictorial paper over boards with black cloth spine. (23pp). 6 full-page chromolithographs. Very good. Faint binding edgewear, else internally near fine. Tight and attractive slim title appears to have been published without title page; front cover title translates "Commit Your Destiny to God!" Consists of several brief Biblical lessons, entirely in German. Lower left corner of front board notes "No. 1913," suggesting this is part of a lengthy series of Biblical lessons for juveniles. Undated, but apparently of turn-of-the-century (1900) vintage. Handsome and charming, with fun front board graphic. Stuttgart: Union Deutsche Verlagsgesellschaft, n.y.. Hardcover. 8vo. Tan cloth with gilt and black lettering and decorations and color plate on front board. viii, 2878pp, (1p), (8pp ads). Color frontispiece, illustrations (some color), decorative endpapers. Very good. Faint bit of mild edgewear, age toning and light soiling (binding only), else overall tight, clean and internally near fine. Attractive later printing of this broad and popular anthology of well-illustrated sentimental verse, fiction and nonfiction, undated but likely circa 1890s. Entirely in German, this 32nd volume is a spinoff on the work of the German children's writer Ottilie Wildermuth (1817-77) as continued by her daughters Agnes Willms and Adelheid Wildermuth. Title translation: "The Youth's Garden: A Present for Young Girls." New York: Kunstdruck und Verlag von Ernst Kaufmann, n.y.. Hardcover. Small 8vo. Glossy pictorial paper over boards with green cloth spine. (24pp). 6 full-page chromolithographs. Very good. Faint binding edgewear, else internally near fine. Tight and attractive slim title appears to have been published without title page; front cover title translates "In the Service of Jehovah." Consists of several brief Biblical lessons, entirely in German. Lower left corner of front board notes "No. 1915," suggesting this is part of a lengthy series of Biblical lessons for juveniles. Undated, but apparently of turn-of-the-century (1900) vintage. Handsome and charming, with fun front board graphic.